The M.V. 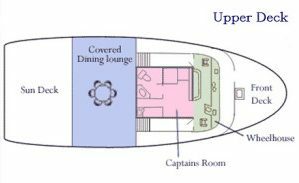 Sikumi provides the comfortable ride and spacious living of a traditional cruise ship, yet is small enough to afford her passengers access to the special places missed by larger cruise ships. In addition to the versatility offered to passengers by the boat, the staff is always eager to cater to the specific needs and desires of their passengers. The result is a once-in-a lifetime cruise for you and your group through the majestic and magnificent Alaskan wilderness aboard a premier Alaska small ship cruise. Join us for our 6 night, 7 day cruise, experience kayaking around icebergs, watching glaciers calve, whales breaching right next to the boat, and black and brown bears strolling along the shores with their young. 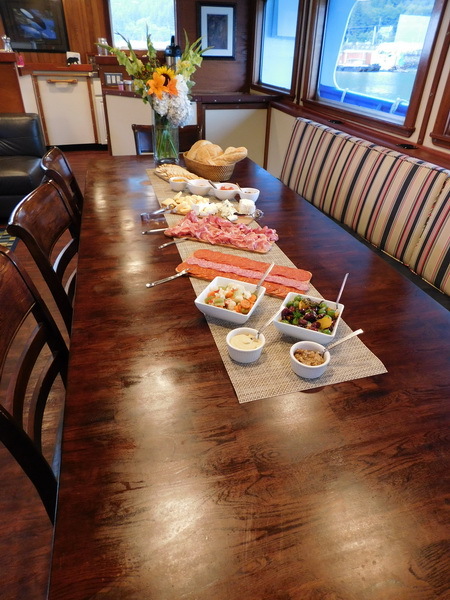 Toss a rod in to catch a salmon or halibut and enjoy fresh caught shrimp and crab while aboard! If you choose the Sikumi for your Alaska adventure, you can count on wonderful cruise cuisine served with a flare. Our chef is very accommodating, and we can make arrangements to have whatever specialty foods and/or wines you would like. The M.V. Sikumi is an Alaska cruise ship specially designed for her passengers to experience the outdoors amid some of the most dramatic scenery the Alaska Inside Passage can offer. View our cruise pricing here. The sleek and recently updated interior of the M.V. Sikumi is comfortable for groups of all sizes. The salon has ample seating areas for all guests to relax and enjoy the panoramic views of Southeast Alaska’s infamous Inside Passage. The state of the art galley is equipped with top of the art equipment to prepare fine Alaska cuisine while aboard. The dining area offers ample space for fine meals. Each of the four staterooms is equipped with its ensuite full bathroom, vanity and queen size beds with plush linens and fine amenities. Our bathrooms are fully stocked with 100% cotton towels, high quality toiletries, and hair dryers. The M/V Sikumi’s spacious upper deck is a perfect place for sightseeing, viewing wildlife, photography, stargazing, or lounging and relaxing. The top level covered dining area and sun deck are ideal for dinner parties, barbecues and casual dining al fresco. The wheelhouse is the best indoor viewing spot on the boat. 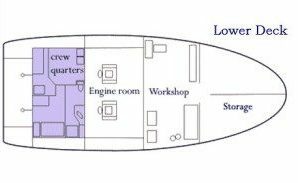 The Lower Deck houses the crew’s quarters, the engine room and the workshop. There is also ample storage space for guests’ excess baggage and empty suitcases to keep stateroom space free. Any cruise in Alaska should be exciting, breathtaking, and memorable. These are things we can promise you on a cruise with us. The M.V. 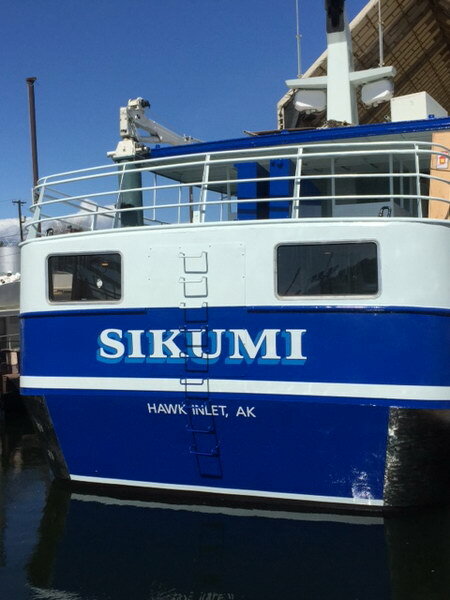 Sikumi was specially designed for her passengers to experience the outdoors amid the vast and majestic Alaskan wilderness. A typical afternoon aboard the Sikumi may include fishing in a sunny bay and grilling on the deck in a hidden cove. Or maybe you’d rather spend your day hiking up mountain ridges or exploring remote islands. Whatever adventures you choose to embark on during your cruise, you can always relax aboard the decks the Sikumi. The Sikumi is a popular host to Alaska cruise vacations, due in large part to the boat’s layout. It is suitable for people of all ages and physical fitness, making it perfect for your cruise in Alaska. The M.V. 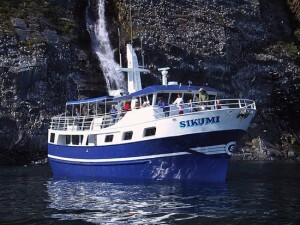 Sikumi was specially designed for her passengers to experience the outdoors amid the vast and majestic Inside Passage. 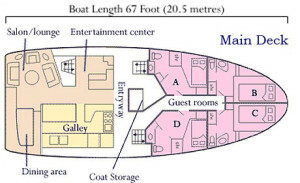 The spacious decks of the M.V. Sikumi are perfect for sightseeing, wildlife viewing, photography, stargazing, or lounging and relaxing. The top level covered dining area and sun deck are ideal for dinner parties, barbecues and casual dining al fresco. A typical afternoon aboard the Sikumi may include fishing in a sunny bay and grilling on the deck in a hidden cove. Or spend your day hiking up mountain ridges or exploring remote islands. Whatever activities you choose to embark on during your cruise, you can always relax aboard the decks of the Sikumi after a day of adventure. Cruise cuisine is not traditionally a focal point of an Alaskan cruise. That is not the case with Custom Alaska Cruises. We pride ourselves on providing original and delectable cuisine to you plate every day. 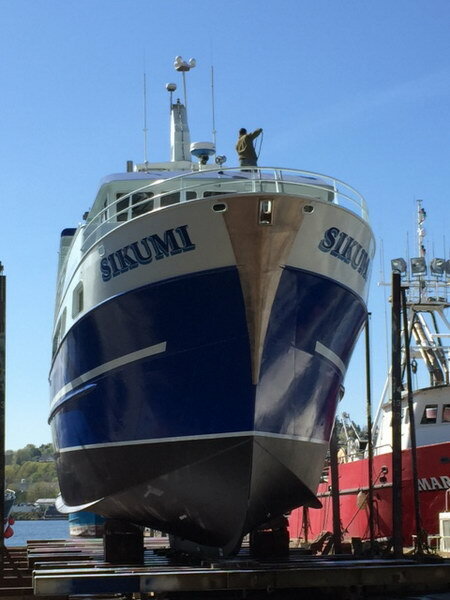 The MV Sikumi is equipped with a commercial galley, providing ample space for our chef to work. Alaska is home to some of the most prized seafood in the world. We can pull fish from the water and begin preparing them immediately. You simply cannot get more fresh seafood anywhere in the world. One of the most impressive features of our Alaska cruise ship is our salon. It is the most common meeting place aboard the vessel, as people gather for meals, to relax in the evening, or for coffee in the morning. The newly redecorated salon features a dining area, wet bar, and lounge area with television, VCR, CD player and library. The diverse facilities of the salon cater to a wide variety of people. We know that everyone is different, so even if people are on the same cruise they are going to want to have their own space and be able to do their own things. The open architecture of the salon allows guests to peer straight into the galley where the chef prepares all the food. The space is large enough to accommodate all of the boat’s passengers, while maintaining a cozy atmosphere uncommon on an Alaska cruise ship. Even on an Alaska family vacation of a lifetime, there will be moments that you will want to slip away and relax. Our lounge is the perfect place to unwind and have some alone time. Passengers find the lounge a wonderful place to sit with a good book or cold drink after one of many exciting days. Our Salon also features a bar which is fully stocked with a selection of beers and wines. Just let the crew know if you want a drink from the bar at any time. Guests are welcome to stock the bar with liquor, unfortunately our license doesn’t allow us to provide this. If you have any special requirements for mixers though, let us know and we can make sure they are available. The bar has all the equipment you need to make a simple Gin and Tonic, right through to a fancy cocktail and for something unique, you can gather and use Glacial Ice to cool your drinks. 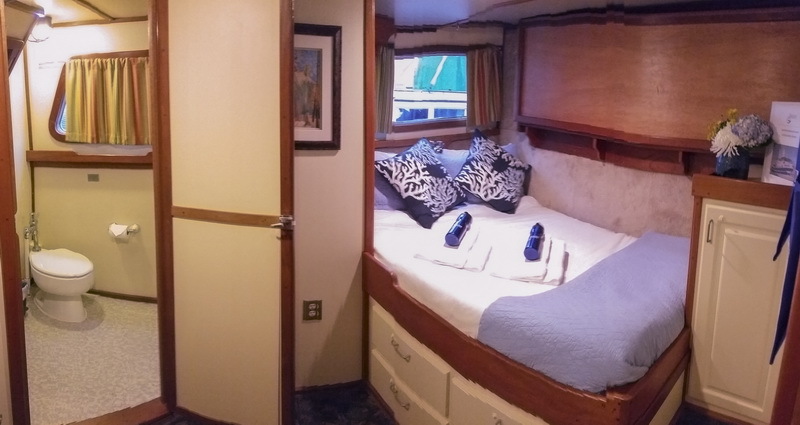 The MV Sikumi guest rooms are comfortable and roomy. Plenty of storage room is available for all your luggage and an optional third bunk easily swings down for more sleeping space. Several regular household (110V) power points available. Each room has a private toilet and shower, making you feel right at home on your Alaska cruise adventure. Our comfy beds are made up with Pure Cotton Sheets and your choice of a Goosedown or Synthetic Duvet and we provide lots of extra warm blankets and soft pillows. There are plenty of fluffy towels in your ensuite bathroom and you’ll also have the range of Baudelaire French Soaps and Body Care products to make you feel really relaxed and pampered. All linen is changed daily unless you request otherwise. 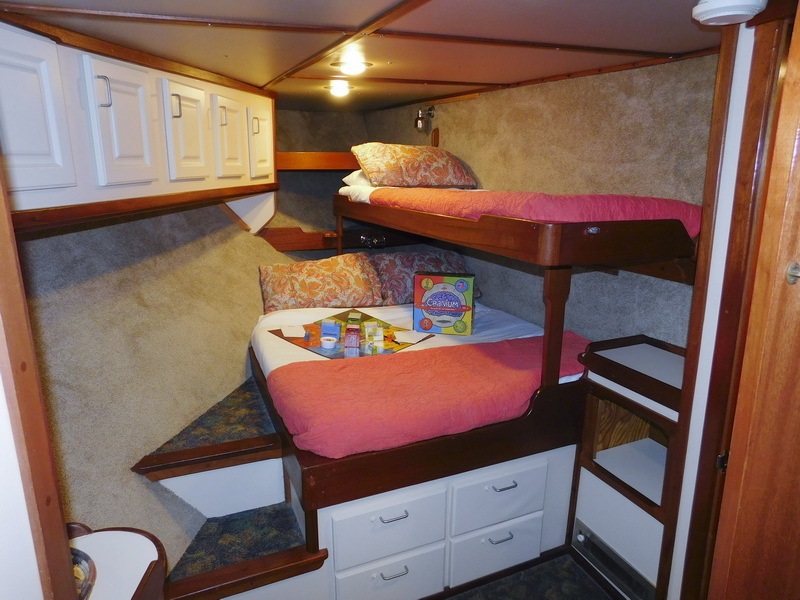 The Staterooms can comfortably accommodate families with a pull down ‘bunkbed’ to sleep an extra person in each room. 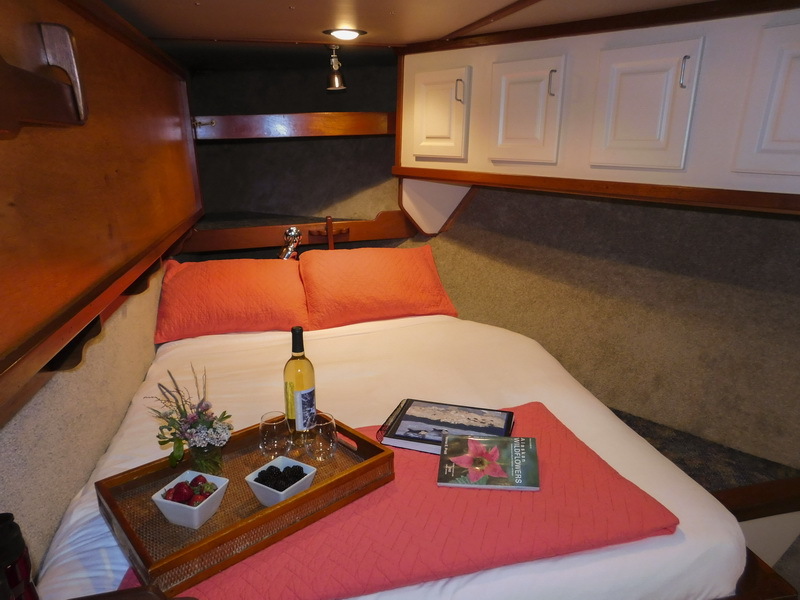 Our Alaska small cruise ship is well equipped to make it as comfortable for our passengers as possible. The commercial galley provides a space for our chef to prepare amazing cuisine on a daily basis. Our salon is a great place to relax with a book or have drinks with friends. We also have computer equipment, allowing you to manipulate and transfer photos. Trading photographs with fellow passengers is a popular activity toward the end of our cruises. 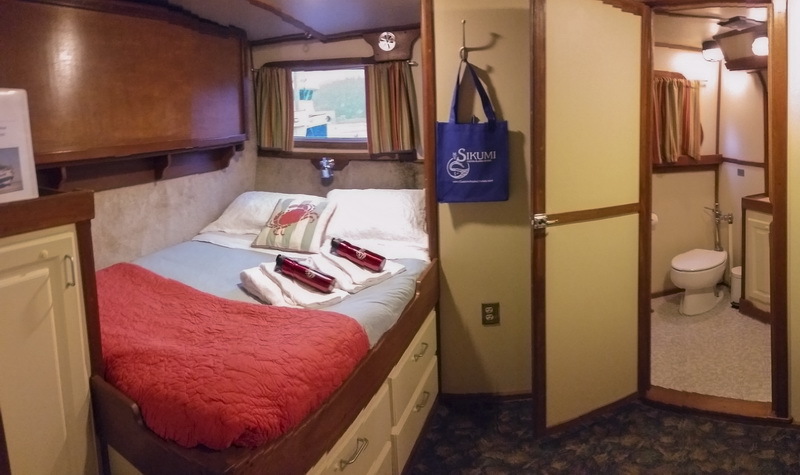 When it’s time to come indoors, the handsome interior of the M/V Sikumi beckon you to rest and relax, or to enjoy quality time with your family and friends. The newly redecorated salon features a dining area, wet bar, and lounge area with television, VCR, CD player and library. The diverse facilities of the salon cater to a wide variety of people. We know that everyone is different, and people on the same cruise will want to have their own space and do their own things. The heart of the salon is our open, restaurant-style galley, which allows our guests to be part of meal preparation without getting their hands dirty! Exchange tips and recipes with our chef as he prepares some of the finest meals you will eat anywhere. Embark on the adventure of a lifetime aboard our Alaska small cruise Motor Vessel Sikumi, as we get you up close to the best Alaska’s wilderness has to offer.